In 1860, Mr. Giles Bowers purchased land from the State of Florida in Section 16 of 1 South 19 West in Walton County. The total land acquired was 40 acres. This is the root of Walter’s Chain of Title issued by the State of Florida with approval from the Federal Government.The Deed uses a TRS Legal description for location of the tract along the eastern line and southern line of Section 16, which is a School Land Section. School Lands are land grants established in support of education. Support for public education in the United States predates the constitution. Two years before the adoption of the United States Constitution of 1787, the Congress of the Confederation provided support for public schooling by establishing the land grants in the Land Ordinance of May 20, 1785 which granted Section 16 (one square mile) of every township to be used for public education: "There shall be reserved the Lot No. 16, of every township, for the maintenance of public schools within said township." The Federal government conveyed Section 16 and other unsold parts of 1 South 19 West to the State of Florida for various reasons. The conveyance of lands to the State for distribution occurred under an express condition of Statehood in 1845 to maintain the TRS grids and to have a County Surveyor oversee that the distribution is correct. 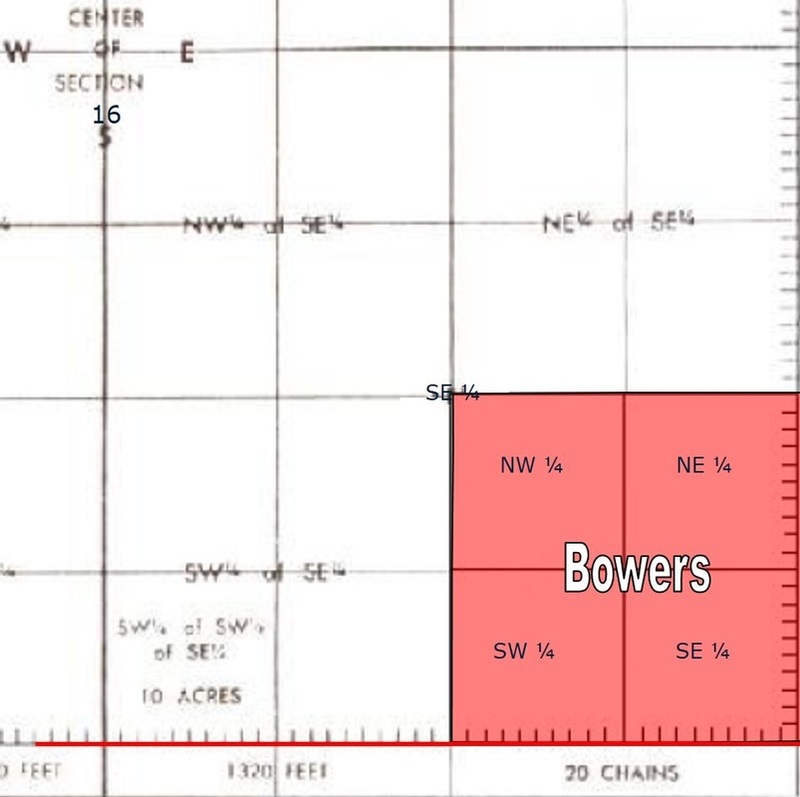 Mr. Bowers is the first person to hold record title in Walter's chain of title, and the State is using the TRS Grid to describe, locate, and sell this land so it is now obligated by law and the Congressional Land Act of February 11, 1805 to maintain the TRS Grids. Notice c that Hugh A. Loorley is the “Register of Public Lands for the State of Florida”. It’s not who he is that is important it is what he is that is important. In the U.S. Supreme Court: STONE v. United States 69 U.S. (1865) (10-0) A patent is the highest evidence of title, and is conclusive as against the government , and all claiming under junior patents or titles, until it is set aside or annulled by some judicial tribunal. The patent is evidence of a grant, and the officer who issues it acts ministerially and not judicially. Clearly the conditionally sub licensed government of Florida acted as the officer, who magisterially acted when Giles Bowers offered to purchased forty acres of Public Land within 1 South 19 west of Walton County, Florida. But this officer fails to require a confirming survey to insure the conditions of “his/her” sub license is maintained, still this officer accepts payment, seals, records, and delivers the Security known as a US Land Patent. In so doing the conditionally sub licensed government of Florida has bound it’s self on both sides to all of the terms and conditions thereto and prescribed by law. Not just in this one transaction but in each and every transaction it bound its self and “bound the United States to a particular course of policy in relation to them by ties as strong as can be invented to secure the faith of the nation”. President Andrew Jackson. This is the original transaction in this “chain”, the public record contains the documented proof of this transaction but there is no indication in or on the face of these documents that the County Surveyor or any surveyor participated in this transaction in any way what so ever. Logic suggests that the county surveyor should at least review, confirm, and certify at some point in the process that this transaction and every transaction, did not alter the TRS Grid thus that it is perpetuated intact. This is the obligation the sub licensed government accepted and is required by law. This review, confirmation, and certification should clearly happen before the new owner is assessed for property taxes and absolutely happen before property taxes are collected. Thus the County Surveyors role in community planning and zoning, utilities access, emergency service access, garbage pick up, mail delivery, and in general; the community development standards is present. But no safeguards appear to be in place to insure the terms of the sub license is not violated. More importantly no safe guards are in place to protect the next entity that purchases and that was clearly part of the policy enacted and the intent of Congress; as they required the “creation” of the County Surveyor in the first place.